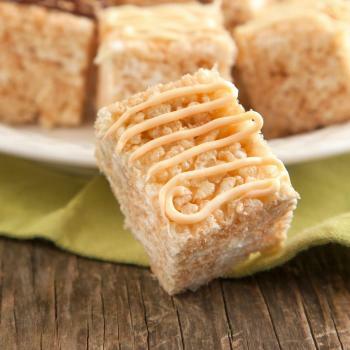 Delicious gourmet crispy rice treats start with a good basic recipe. From there, you can add additional flavors to take them up to the next level. With the deep caramel flavor of browned butter and a nice bite of ginger and orange, these treats go well beyond your childhood favorite. Start with the ingredients from the basic recipe (linked above). Brown the butter from the original recipe before adding it to this gourmet version. To do this, put the butter over medium-high heat in a skillet with a white or metal base (it can't have a black coating or you won't see the butter brown). Add the ginger and orange zest. Melt the butter, swirling as it melts, until it just turns brown and fragrant. Add the butter to the recipe and continue as written. Allow the treats to cool. In a small bowl, whisk together the powdered sugar. Add the orange juice 1 tablespoon at a time until you get a glaze that is the consistency needed to drizzle it over the treats. Drizzle over the treats. Allow the glaze to harden before cutting into individual pieces. 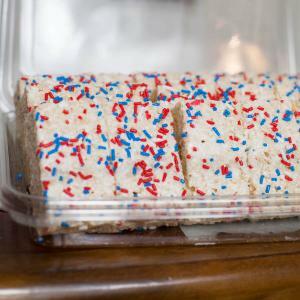 To get started, make the treats as written in the recipe and cut them into squares after they have cooled. Then, use the following ingredients and steps. 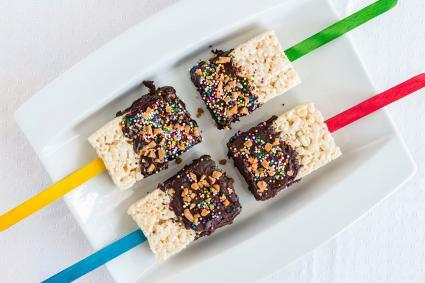 Insert popsicle sticks into the base of each of the treats. 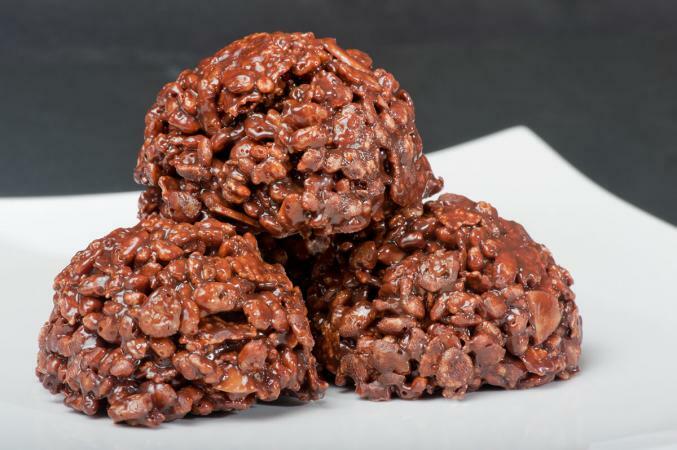 In a double boiler, melt the chocolate chips and coconut oil over low heat, stirring to combine. Remove from the heat. While the chocolate is hot, dip each of the squares half into the chocolate. Lay each on a piece of parchment. Sprinkle with the peanuts and the sprinkles before the chocolate sets. Allow the chocolate to cool and set completely. You'll need the ingredients from the basic recipe here, plus a few additional ingredients, but the method is slightly different. In a large pan, melt the butter on medium-high heat. Stir in the marshmallows and cook until melted. Remove from the heat and stir in the Nutella. Stir into the rice cereal. Using buttered hands, form into individual 1 tablespoon sized mounds and place on parchment paper to cool. To make these, start with the basic recipe, but add additional ingredients and steps. Melt the butter in a pan according to the original recipe. Then, add the marshmallows and cook to melt, as well, stirring constantly. Remove from the heat and stir in the almond butter. In the bowl with the rice cereal, add the cranberries and almonds until well mixed. Pour the hot butter/marshmallow/almond butter mixture over the top. Press into the pan according to the original recipe and allow to cool completely. Cut into squares. In a double boiler, melt the white chocolate chips over low heat with the almond extract and coconut oil, stirring constantly until smooth. Dip each of the squares into the white chocolate mixture and set aside to cool on a wire rack. If desired, while the white chocolate is still warm and not yet set, sprinkle with the colored sprinkles. 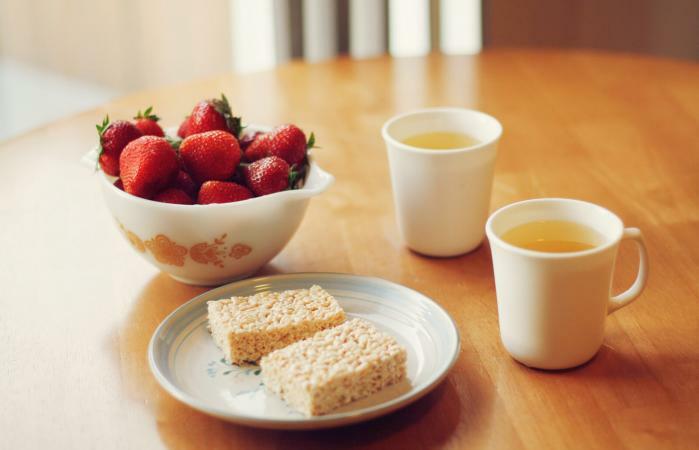 One of the great things about crispy rice treats is how easy they are to fancy them up. Whether you drizzle, ice, dip, or add additional ingredients, the basic recipe is the perfect neutral palate to place with flavors.